The works of Shakespeare and the Bible are closely related treasures an the cultural and spiritual life of western peoples. Both stand pre-eminent among forces that have built up the finest and most lasting features of our present civilization. Embodying all the great fundamental principles lying at the very heart of life, they have been interwoven in the fabric of our daily thought and aspiration. Countless expressions that have been given to those principles in art and literature have been directly inspired by sacred scriptures on the one hand and the Lay Bible of Shakespeare on the other. There appears to be ample justification for regarding Shakespeare as a Lay Bible when considering its many correspondences, inner and outer, with those of the Holy Bible. Both are bestsellers. Both comprise a collection of Books, the Holy Scriptures having sixty-six and Shakespeare thirty-seven. Both have their Apocrypha. Both have concordances cataloguing every word of the text. Both have called forth innumerable commentaries. Special libraries have been dedicated to their sole study. In dictionaries of quotations, the Bible and Shakespeare lead all other works. In Bartlett's volume of quotations, the New and Old Testament combined take up thirty-seven pages whereas Shakespeare requires no less than one hundred and twenty-two. Phrases from these master works have furnished authors with countless titles for books and articles. One single phrase from a soliloquy of Macbeth's: "tomorrow -- and tomorrow," has served as the title for as many as eleven books. Many biblical phrases and quotations have been interwoven into Shakespearean texts. According to an inventory of this subject, Shakespeare quoted from no less than forty-two books of the Bible and the Apocrypha. Shakespeare and the Bible are inexhaustible sources of inspiration. Every age discovers in them that which it most needs. Hence, the continuous flow of expository material ever since their first appearance. Re-interpretation becomes necessary as conditions change, as knowledge widens and as experience deepens. But whatever the changes, the Bible and Shakespeare live on. In every age the eternal verities hold good and nowhere else can these be found in the fullness, beauty, and sublimity with which we meet them in both the Bible and Shakespeare. 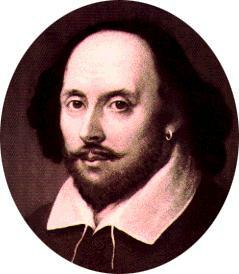 Barring scripture, Shakespeare's plays constitute mankind's greatest study of man. "After God," writes Alexander Pushkin, Russia's greatest poet, "Shakespeare is the greatest creator of living beings. He created an entire humanity." These plays deal with man's outer and inner nature; with worlds visible and invisible. The two sides of life, the material and spiritual, are treated with equal certainty and consistency. The supernatural elements in the dramas are not incidental devices introduced for the purpose of theatrical effects. They are fundamental to the theme. Anyone possessing keys to their deeper import discerns an added wealth of wisdom. No one familiar with esoteric doctrines can have any question as to Shakespeare's familiarity with the wisdom of the Illuminati. Occult studies of magic, black and white, are given illuminating treatment in Richard III and The Tempest, respectively. The spiritual significances of the Winter and Summer Solstices are unfolded in The Winter's Tale and Midsummer Night's Dream. Under the veil of fancy and frolic, the latter is a virtual transcription of the mystic marriage ritual as enacted in the Eleusinian Mysteries -- in keeping with which the locale of the drama is a wood near Athens. The Sonnets translate the Hermetic doctrines into poetry. While tragedies like Hamlet and Macbeth bring the beings and forces of the interpenetrating spiritual world into visibility. Each of the dramas treats of some occult law or spiritual principle. This constitutes its esoteric theme. Everything that finds expression in the unfolding plot arises inevitably in accordance with the nature of this central archetypal idea. In considering the inner features common to Shakespeare and the Bible, it is to be observed that all literature may be divided into two classes, sacred and secular. Sacred literature is accredited with having come from a higher source of inspiration than the secular. Divine wisdom is accredited with having found expression in the bibles of the world in a more direct and immediate manner than any other literature. In other words, it is a part of the religious belief of all peoples that in sacred scriptures God establishes direct communication with man, revealing Himself therein in a special manner and imparting to those willing to receive them, mysteries pertaining to inner spiritual life and ways and means by which man progressively unfolds his latent divinity. With this general concept the esotericist is in full agreement. There are, however, some who maintain that the distinction generally made between sacred and secular literature is purely arbitrary and that, while the classification serves a useful purpose, there does not exist factually such a sharp line of demarcation as many people believe. Those who hold to this view believe that the only difference between the two classes is one of degree, the one merging imperceptibly into the other. In support of this position they point out that human elements have certainly crept into sacred scriptures and that sacred truths are often given superlative expression in secular literature. At this point Swedenborg provides an answer by saying that while it is true that the difference is only one of degree, it is a discrete degree. That is to say, there is a point on the rising scale of values at which a new factor enters and a new principle becomes operative which results in bringing something new into being. For example, all life is one, but not all that lives is human. There is life in plant and animal. But when a plant takes on the faculty of feeling, sensing pain and pleasure, and becomes capable of locomotion, it becomes an animal; and when an animal takes on the rational faculties of mind it becomes human. Discrete degrees mark the distinction between the kingdoms of life and nature. Applying this to literature, Swedenborg observed that such a discrete degree divides sacred from secular literature. Sacred literature is first of all purely religious. But not all religious works are sacred scriptures. In order to qualify as such they must deal with spiritual matters and also possess a certain internal content. That is, concealed beneath the outer form and embodied within the history and biography, the fable and parable, there must needs be a spiritual structure, an esoteric content, clearly perceptible to those who have developed within themselves the necessary spiritual cognition; but unrecognized by those who see no more than "the fond eye doth teach." Sacred scriptures, moreover, are records of the life, works and/or teachings of great world Saviors. Consequently they deal exclusively with the deepest spiritual mysteries within the grasp of man. Summarizing the foregoing, we may say that literature which deals with spiritual life and is built around world Teachers and Saviors, and in addition thereto embodies an internal structure based on the mysteries, becomes by virtue of these several attributes and elements sacred scriptures. All other literature takes a lesser rating. Turning to the entire remaining body of non-sacred literature it will be found that this, in turn, also falls into two major divisions. In the first division we have the literature that is possessed of an "internal" sense; in the second, the external only. The former, like sacred scriptures, is rooted in the Mysteries and contains within its outer form a veiled body of clearly organized Arcane Wisdom, whereas in the latter class no such interwoven esotericism is present. To the exotericist, therefore, no such distinction as that which we have made is accepted as valid for the simple reason that the very existence of what we call the Divine Gnosis or Secret Doctrine is completely unrecognized. I earned works there are about spiritual matters, religious experience, and even about the Mysteries themselves which do not possess this internal sense. They may be highly inspired works yet only single-structured. On the other hand, we have works like the dramas of Shakespeare which the world does not regard as "spiritual" literature but which, by virtue of their double structure, enshrine a compendium of Initiate Wisdom comparable only to that which informs sacred scriptures. Hence, the Lay Bible. For true authorship of works bearing the name of Shakespeare one must peer behind the veil that conceals the Guardians of the Mysteries. There are to be found the Illuminati of the race, the custodians of Ageless Wisdom, dispensers of the truth that sets men free. There, unrecognized and unknown to the multitude, is that company of exalted Beings we call our Elder Brothers, who release into the world from time to time through suitable and qualified human instrumentalities, revelations most needed for their development. It is to them we must look for the mighty creative impulse that manifested in Europe as the Renaissance and found its primary English expression in the brilliant literary lights of the Elizabethan Era -- the greatest of which was Shakespeare. Thus Shakespeare becomes a link in a chain of inspired mediators through whom the race of men have come into possession of an ever-increasing knowledge of the divine Mysteries. The works of Shakespeare, like the music-dramas of Wagner, Goethe's Faust, Dante's Divine Comedy, and a few other books of comparable rank, are designed for esoteric as well as exoteric reading. They are direct communications from planetary centers of Divine Wisdom. In the case of Shakespeare, the source was the Western Wisdom School of the Rosy Cross. To the esotericist no other evidence of this is required than the works themselves. But specific signatures, cryptically conveyed, are also present in the dramas. In Love's Labour's Lost a whole scene is devoted to revealing the Rosicrucian connection; but it is so ingeniously involved in the banter of words that only those possessing the keys to its veiled meanings will read it aright. The scene closes with a remark addressed to Goodman Dull, representative of the unperceiving multitude, that during the entire scene he has not spoken a word. "No," comes his response, "nor understood none neither." Shakespeare has been called "The Rosicrucian Mask." Max Heindel is authority for the statement that the works which bear the name of Shakespeare and those that bear the name of Bacon were influenced by the same Rosicrucian Initiate. Other occult writers point toward a similar conclusion. In the class of literature we have here described, Shakespeare's dramas stand supreme. They are not religious works. They are not Christian, Buddhist, or Hindu Scriptures. They are what we call secular dramas, worldly plays if you like. But so transcendent is their beauty and so luminous is their internal content, that they have held countless millions enthralled during their uninterrupted performance on the world's stages ever since their first appearance over three hundred and fifty years ago. People see and read the plays for pleasure and pastime. In doing so they expose themselves to a magic that, by its very nature, works upon their inner being, imparting to it basic patterns of the good and the true and the beautiful, charging it with impulses that propel it upward on its godward way. The magical influence which they so exercise derives from that element which flowed into them from super-human levels. These elements are purely spiritual. It is their presence in the dramas that truly makes of Shakespeare's plays humanity's Lay Bible.